There is a great way to lose weight that not many people are familiar with. It is called “cleaning” and it is simply the best weight-loss program in existence. If you want to shed some of those extra pounds, then you should by all means arm yourself with a mop and some rags and start cleaning like you have never cleaned before. There are so many exercises you can try out; like mopping, dusting, scrubbing (scrubbing is great, I lost ten pounds after my pregnancy this way) and many, many more. Let us look at some practical ways to clean that would further increase the weight-loss process. * Note that cleaning is only good for losing weight; not good for gaining muscle. Mopping and sweeping are great ways to get acquainted with the practice of cleaning. Even though mopping and/or sweeping do not seem like much of a challenge, I know a way to make things more interesting. Just cut your working extension in half – this way you can only use one arm. Mopping/sweeping with only ONE arm will prove more challenging than climbing the Empire State building! Alternate between arms to get the most from this exercise. Seems simple enough, right? Wrong! If you really want to feel the burn, dusting might be the best method out there. People think dusting is easy because all you have to do is wave a feather duster around, or a microfibre cloth. Try dusting something that is a tad out of your reach and you will see that things are not as easy as they appear. Like we did with the mop/broom, we aren’t going to use any additional extensions. Most dusters do have telescope like extensions, but you can just opt not use them, it’s that simple. 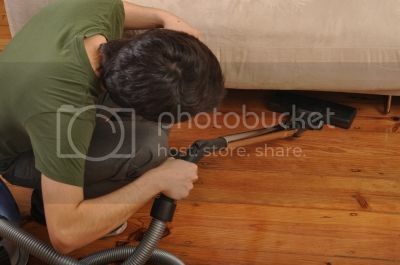 Vacuuming is an ‘easy’ way to get rid of floor dust, although I know from a fact that it is not that easy after all. You can incorporate an activity as simple as vacuuming into a workout session, and get a fantastic workout. When vacuuming, instead of standing up and pushing the vacuum around, why not crouch? That’s right; crouch behind your vacuum cleaner and push it as you go. The rules are you can never stand up, and you must keep the vacuum moving. Five (5) minutes of this and you will wish you had no vacuum. No, we are not going to format our C drive. We are, however, going to give all of our windows a nice buff. Window cleaning can be extremely easy if you use a ladder, a scaffold, proper equipment and proper detergents. To make this exercise more interesting, we are going to forget about that ladder and scaffold and use a simple squeegee. We are not going to cut the extender on that one, on the contrary – we are going to get the biggest, longest extender available (even if you live on the first floor). Get as far away from your windows as possible, then using a hose and your squeegee, wash and wipe your windows clean. The bigger the extender, the harder it is going to be on you to move it – case and point. Combine all this with proper diet, and you will start dropping weight like crazy. How To Increase Effectiveness of Your Weight Loss Training!